Ananka's Diary: People always clap for the wrong things. Gosh, some people are so rude! I mean, if someone dies you cant go and bad mouth them! Yes, sometime people's opinions are wrong. Nevertheless, sometimes it is those very opinions that change the way we think. People's ideas can be completely and utterly wrong, but sometimes its is those ideas that lead us to the right ideas by the people who oppose the idea. I didn't know he died! I live very close to Cornish, where he lived. He was... Weird, but that gives people no right to badmouth an author who truly changed YA literature! As with many visionaries and true genius, the little decriers always hide in the background, trying to get their word in. 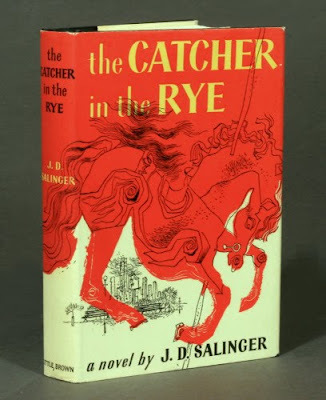 The Catcher in the Rye is an extraordinary work and J D Salinger an extraordinary man. Journalists and Americans in general should learn to respect their dead. I've never read his book, but the day after he died I found a really rude newspaper article in the chicago tribune. Saying what a great book it is would not get the reporter or newspaper any publicity. Saying what an awful book it is however will. God I'm Reading catcher in the rye and I love it! It's totaly life changing! John may be weird but he modernized the way we think of the ya books! He is in a way one of my heros! How anyone could burn him like that is rude! Reel dancer- it's about a teen punk who is expelled from his school and he runs away to new York city. hahah I absolutely detested Holden and disliked the book when I read it. I read 'Catcher in the Rye' about two years ago and I didn't fall in love with it or have it down as one of my favourite books. For me, it was just another story. Wirtten quite a long time ago. But nontheless, YA Lit. But people really shouldn't badmouth someone, especially after they've died. I believe it's about a teenage rebel. You'd think that people would have more respect for the dead. Especially one that has created such an impact. I'm a bit surprised people consider that "young adult", as it deals with subjects people think are "too old" for kids. Thumb Biter: Yes, I can see the resemblance. Heh heh. I've heard that the book is really good, and it is on my list of books to read. But if people do not enjoy it, they shouldn't speak about the book or the author in a negative manner, because there are many people in the world who have opinions that are completely different. It is quite selfish to tell people that the book is horrible, without giving them a chance to make their own decision.